The Inventory Collector monitor collects the basic machine information that is shown in the System Details box on the Server Status Report. Most of the collected information does not change often, so the monitor defaults to running every few hours. The System Details and Inventory probe has a few extra system requirements to allow the probe to be able to scan the server. If you are you are receiving error messages about installing .NET or Powershell, you can resolve the error by installing the necessary items or by unchecking the second option, "Collecting System Details and Inventory data with the System Details program". 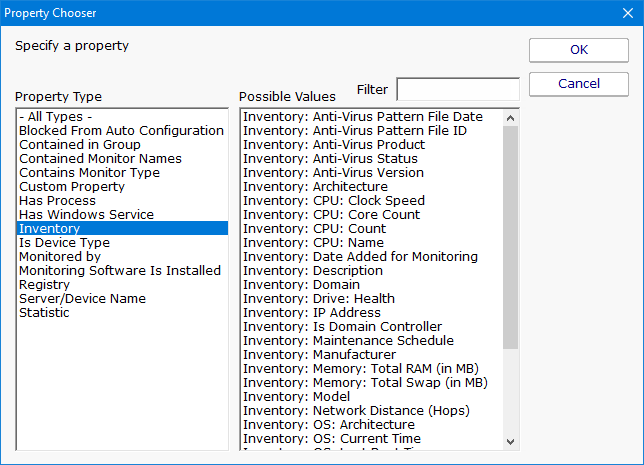 The System Details program (second check box from the top) can collect information about anti-virus applications installed on Windows computers. Supported applications and versions are listed below. Depending on how the anti-virus manufacturers change or don't change their settings, other versions might also be successfully detected. The information collected by the Inventory Collector will populate the Inventory Database. You can run reports against this database and use a simple expression builder to specify exactly which servers you'd like to show up in the report. Once the target servers are specified, you can select the output columns that should be shown. Additional inventory property values are being added all the time.